Indigo Furniture the UKs most iconic and unique wooden furniture designer and manufacturer have launched a stunning new dining room table as part of their Riven Oak Furniture Range. The newly designed table known as the Riven Oak Farm Table takes its inspiration from traditional farmhouse designs as well as French 19th century farmhouse tables. Both of these inspirations reflect the strong, practical designs which have become the signature of Indigo Furniture. The dining room table which has been hugely popular since its grand unveiling to the public, is available in varying sizes meaning that however big or small the dining room space Indigo Furniture’s new Oak Dining Table will fit it perfectly. It is certain that this new dining table will become an instant classic in the Indigo Furniture range of Oak and Plank designs. The new Riven Oak Farm Bench takes its place next to some of Indigo Furniture’s most loved and classic pieces. The furniture company originally only used plank furniture for their designs but decided to expand their range to include Oak Furniture after demand from customers who already loved their plank furniture designs. The collection was launched in the Summer of 2011 and was given the name “Riven Oak” after a competition which asked customers and Indigo Furniture Fans to come up with a suitable name for the collection. It was crucial to Indigo that the designs, finish and Oak itself were of the same high quality that they were already producing for not only the new dining room table but the entire range. To achieve this they spent a long time sourcing materials, designing and restoring a 1930’s ripsaw which would eventually go on to leave the wood with the markings from the manufacturing process. Unlike other furniture designers who sand these markings away to create identical pieces of furniture, Indigo do the opposite and celebrate and revel in the unique individuality of each piece and the manufacturing markings which give the pieces that effect. The dining room table itself looks similar to traditional farmhouse tables, famous for their thick tops and solid beams that make up the workspace but as with everything else that Indigo Furniture turn their hand to they have put their own unique spin on it. Keeping to one of their key values of only using the very highest quality of materials led them to the Baltic Coast where a family run saw mill was producing beautiful pieces of oak from a forest which was managed in an economically and environmentally friendly way. Indigo Furniture take random sized pieces of the Oak and cut them to the exact sizes they need for the table so that no piece exactly matches, adding to the unique style, design and individuality that Indigo are famous for. The table is the perfect place for dining with friends and family and is guaranteed to be in every family home for years to come due to the impressive 15 year guarantee that Indigo Furniture give to all of their products. Due to the quality of both the workmanship and materials Indigo offer this impressive guarantee as a standard which serves as a constant reminder of the confidence they have in their craftsmanship and the reason why they are synonymous with quality. 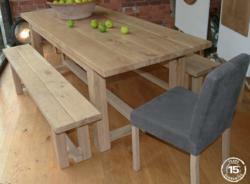 The Riven Oak Farm Table can be paired with a new Riven Oak Farm Bench on either side to complete the stylish rustic look. Alternatively, it can be matched with one of Indigo’s extensive range of stunning Wooden, Fabric or Leather dining chairs. Whatever your choice we are sure that this new dining table will become an instant classic in the Indigo Furniture range of Oak and Plank designs.